22 miles north of Boston, Salem sits peacefully on the bay -- a city whose cultural identity is reflective of its role as the location of the Salem Witch Trials. 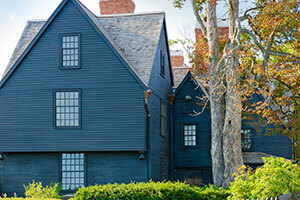 Residents know Salem as a mix of important historical sites and a vibrant downtown. In 2012 Salem won the Retailers Association of Massachusetts' "Best Shopping District" award. Don't hesitate to contact Sagan Harborside with your questions about buying or selling homes in Salem. Make searching easier: Register to save your favorite listings, save your searches, and receive notifications when new listings match your search criteria. **WATERFRONT WITH DOCK** on desirable Winter Island. This slice of paradise approached by a short causeway is made up of 12 private residences along with a public park and walking trails. A spacious well maintained 3 bedroom 2 1/2 bath contemporary/colonial offering an open floor plan perfect for entertaining. Updated kitchen with granite countertops and cherrywood cabinets open to dining area and great room with gas fireplace and sliders that lead to a nice back yard overlooking the water. Oak hardwood flooring throughout main level. The upper level hosts a large master bedroom, newly carpeted with en suite bathroom, loft office and Juliet balcony for enjoying more water views. Also another 2 bedrooms, one could serve as possible 2nd master with new carpeting. A full bath and laundry. Don't miss out on this rare opportunity. Salem, the place you want to be for fine restaurants, museums and shops along with the convenience of the Commuter Rail and Salem Ferry. This is a great buy for an investor! This 3 unit multi-family is located in one of Salem's most desired historic neighborhoods and is close to Salem Commons, House of Seven Gables, a short distance to the waterfront restaurants and hotel, and near the Salem ferry. The first and second-floor units have 3 bedrooms and the third-floor unit has 2 bedrooms. Each unit has hardwood floors, ceiling fans, a large eat-in kitchen w/gas stove & dishwasher, a full bath, a storage space, and a living room. There is laundry on the 3rd floor, and the basement is finished. There have been recent updates to the kitchen, bathrooms, and the building was recently painted. Additional bonuses are cute fenced-in outside patio/sitting area for residents to entertain guests on hot summer nights .Unit #2 is vacant and using a projected rent.